Though Zucchini is from squash family, it resembles a lot like Japaneese Eggplant and can be easily molded into several great recipes. This is less moist compare to Yellow Squash and also known as Italian Squash and it tastes great in Italian recipes like Pasta or Pizza or even in Pancakes. Today I twisted the typical Pancakes recipe with the Zucchini and made them little sassy and savory. The outcome is Great and the whole family enjoyed this fuller breakfast. Here is the recipe, Njoy! Wash and Remove the edges on both sides and grate Zucchini, let the Zucchini sit in the colander for 5 min. It helps to drain the excess water. Then squeeze the grated zucchini in your palms to remove all the moist in it and keep it in a bowl. Beat 2 eggs in a small bowl and whisk together and add this to zucchini in the bowl. Mix all dry ingredients APF, Parmesan Cheese salt, baking powder oregano in a bowl. Let it sit for 10 min to make the flavors work inside. Add the dry flour mixture to Eggs and Zucchni mixture and combine well until it forms like thick batter. ( no need to add any water). Heat the Non-stick pan and heat the oil for shallow frying. Once the oil is hot, drop spoonfulls of batter into Pan and turn them to other side as they cooked good and turn to Golden color. Repeat the same steps until all the batter is done. Dry the pancakes with paper towels and serve these savory pancakes warm. Usually I leave skin ON for Zucchini, it helps for great coloring effects in the dish and extra fiber too. If you don't like it, feel free to peel the Zucchini before grating it. Wait until the Oil is hot before dropping the batter into non-stick pan. 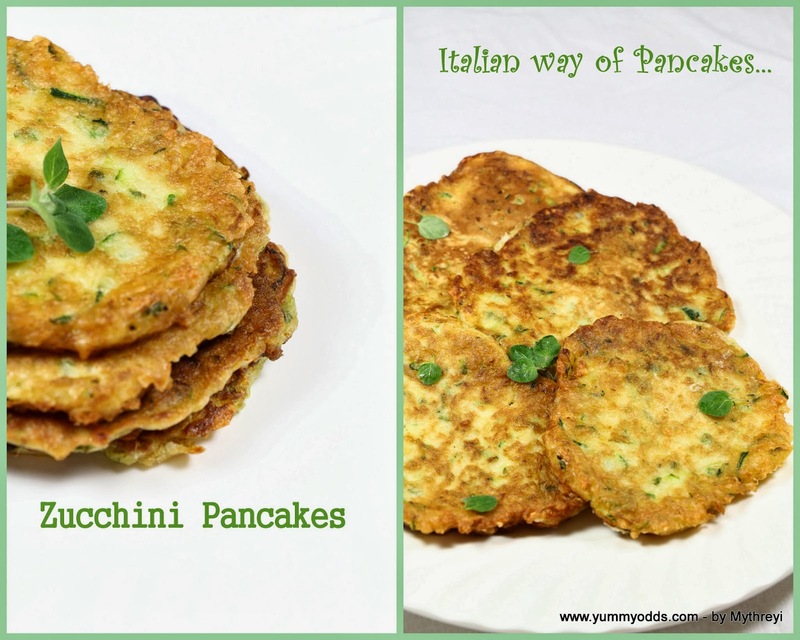 Check out the Following collection for exclusive Zucchini and Pancakes. A perfect snack, love the flavors. Your Zucchini Pancakes look delicious and a great side dish! Thank you so much for taking the time during this busy season to share your wonderful post with Full Plate Thursday. Have a wonderful weekend and hope to see you again real soon!